A joint initiative of Carnegie Corporation of New York and the American Library Association. 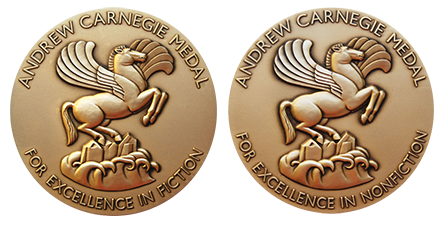 The Andrew Carnegie Medals for Excellence in Fiction and Nonfiction, established in 2012, recognize the best fiction and nonfiction books for adult readers published in the U.S. in the previous year and serve as a guide to help adults select quality reading material. They are the first single-book awards for adult books given by the American Library Association and reflect the expert judgment and insight of library professionals who work closely with adult readers. The winners (one for fiction, one for nonfiction) are announced at an event at the ALA Midwinter Meeting; winning authors receive a $5,000 cash award. For more information on award seals, please visit the ALA store. A longlist comprised of no more than 50 titles is released in September. Six finalists, three fiction and three nonfiction, are announced in October. The winners are announced at the RUSA Book and Media Awards Ceremony in January at the American Library Association's Midwinter Meeting each year. The Medals are made possible, in part, by a grant from Carnegie Corporation of New York in recognition of Andrew Carnegie’s deep belief in the power of books and learning to change the world, and are co-sponsored by ALA’s Booklist and the Reference and User Services Association (RUSA). Booklist is the book review magazine of the American Library Association, considered an essential collection development and readers' advisory tool by thousands of librarians for more than 100 years. Booklist Online includes a growing archive of 160,000+ reviews available to subscribers as well as a wealth of free content offering the latest news and views on books and media. Established in 1876, the American Library Association (ALA) is a non-profit 501(c)(3) organization created to provide leadership in the transformation and the development, promotion, and improvement of library and information services as well as the profession of librarianship in order to enhance learning and ensure access to information for all.